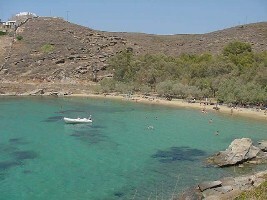 The little known island of Kserimos is one of the best kept secrets of the Aegean sea. Although it can be difficult to get to, the effort is more than repaid as Kserimos is one of the most peaceful and unspoilt islands in Greece. With a population of less than 100 and just one road, Kserimos is the perfect getaway for those who want to avoid the crowds and noise of some of its more popular neighbours. At night the only sound is of the waves breaking on the beach and the tinkling of goat bells. Some of the best beaches are to be found on the South side and can only be reached on foot. There are no hotels on Kserimos although in the summer a few rooms are available for rent. The best place to ask is at the "O Ioannis" taverna at the harbour. The taverna itself has a couple of rooms but if these are not available ask for Alexia Kritikou whose house is close by. 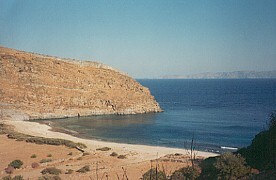 Camping is not officially permitted on Kserimos but those who pitch tents on the beach on the Southern side of the island (see right) are usually left alone. Anyone planning this option should be prepared to take plenty of fresh water with them. Until just a few years back, Kserimos had no electricity supply apart from a few generators and any nightlife such as it was ended at sunset. These days, Kserimos has most modern conveniences although visitors should note that all water has to be brought in and this should be treated as a scarce resource. There is just one payphone available in the main street although if this is not working, an increasing number of the island's residents have cell phones. The "O Ioannis taverna" can be recommended although the menu tends to be rather limited. The fish is usually excellent and if you time it right you can take your pick from the latest catch (Ioanni himself often goes out early morning in his small fishing boat). There is one other small taverna on the quayside where you will be encouraged to go into the kitchen to choose amongst the dishes on offer. There is also a bar on the beach which offers snacks and sometimes grilled octopus depending on availability. Those planning to stay for more than a couple of days should consider taking their own food as there is a very limited supply in the one or two shops on the island. In the height of the summer, caiques call in at Kserimos two or three times a day although off season they tend to be much less frequent. Note that in strong winds (which may last several days) there are no caique services to neighbouring islands at all although sometimes larger boats moor in the deeper waters offshore to enable goods and passengers to be transferred to the island. There is one road which runs along the north side of Kserimos but the South can only be accessed by foot along the well marked donkey path. One of the fishermen sometimes arranges trips around the island and by arrangement can take small groups to one of the remote beaches on the east coast.